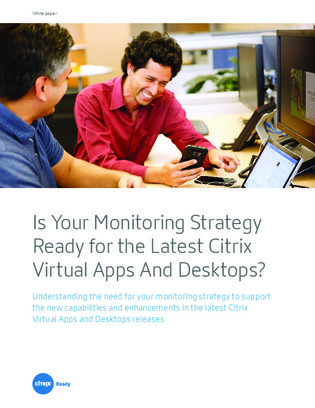 Is Your Monitoring Strategy Ready for the Latest Citrix Virtual Apps and Desktops? With Citrix Virtual Apps and Desktops 7 come new enhancements and functionalities to help users achieve better digital workspace experiences – but for performance monitoring to be truly effective in 7 environments, the monitoring solution should support specific capabilities. In this white paper learn about the new features and functionalities introduced in Citrix Virtual Apps and Desktops 7. Plus, uncover which capabilities your monitoring strategy should be able to support and what to look for in a third-party Citrix monitoring solution.